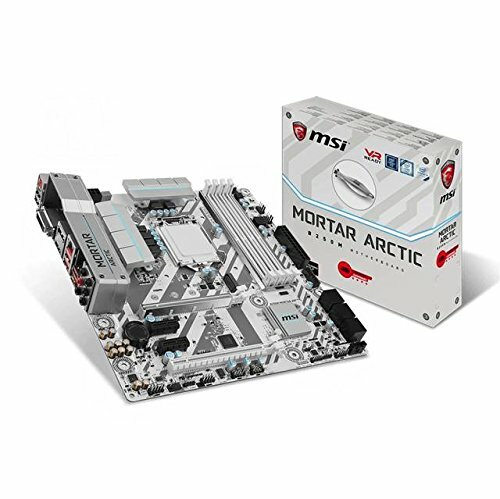 Motherboard: MSI B250M Mortar Arctic(90$- paid 80$ after a sale) Love the board. We decided to go with a white/black/blue color scheme for the build and this board fits the aesthetic perfectly. It has silver and blue head spreaders on the vrms, white leds, and and a black/blue/ greyish I/O cover. aside from the looks, it has a lot of nice features such as reinforced PCIe lanes and sideways sata ports. I spent more on the motherboard than I needed because I wanted a white one and I'm extremely happy with this motherboard, everything you need for an non-overclockable gaming build. Very nice non-oc motherboard. Could use more usb slots in the back, but looks really good. Very mild led lights on board. Bios is okay. I LOVE this motherboard. The UEFI BIOS is super easy to navigate, and the aesthetics of it all, including the white LED's, just go together with the build nicely. A really nice MB. It has 3 fan headers and 1 CPU fan header. Got it for $83.